Mega Bigshock Description from the site, translated by Google Translate. The Jolt goes bold! This has actually missed the Mega number – a handy blaster pistol in the format. “Handy” is of course a relative term – compared with Centurion, Thunderbow and Magnus the BigShock is actually a showcase Blaster for slim shapes and small size … But that’s not difficult. Measured by conventional blasters from the N-Strike Elite series and it is still here, of course, a mega-monster – which applies to both the appearance and the performance of the BigShock. The operation is very similar to a Jolt, so it is one of the more minimalist approaches to the rapid acceleration foam. The cocking handle on the bottom of the handle is pulled, pushed one of the huge mega darts from the front in the race – and the blaster is ready to fire. On the top there is also a small compartment in which an additional Megadart can be kept as a reserve. Is there no darts loaded, so this Darth age can also be used as a target optics – ensures a recessed hole on the front that the sighting of players, targets or plastic bottles makes it a lightness. 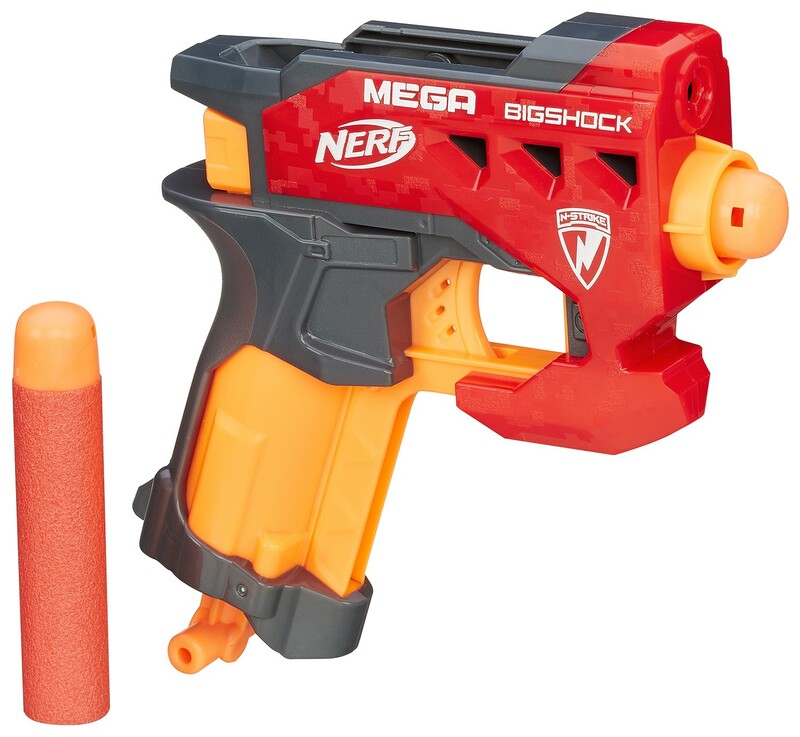 The Mega Bigshock should operate in a very similar way to the Jolt. I’m glad Nerf can continue to get better and better ranges out of small sized blasters. A close up product shot of the Elite Slingshock. Elite Slingshock Description from the site, translated by Google Translate. Well … So has really longs none, hats expected much less someone – but it’s still cool. The Sling Hock looks and works like a slingshot or catapult – only that it fires foam darts that we know and love. Simply push a dart in front of the barrel, pull a cord, release – and you’ve got his darts thanks to the increased range of the N-Strike Elite XD series about 21m far missed. The usability is of course a little easier. Thus, the objectives of the Sling Hock just for kids is much easier than with a real slingshot. On the left and right side of the Blasters ever a holder for spare ammo … If the first dart is so should not sit will be provided for a second and third chance! Although I’m not really a slingshot fan, it’s nice to see Nerf making something a little different then what were used to seeing and using. I wonder how modders will get even more range out of this? Looks like it’s trying to appeal to younger people, while at the same time getting the Elite XD ranges were starting to get more and more used to. 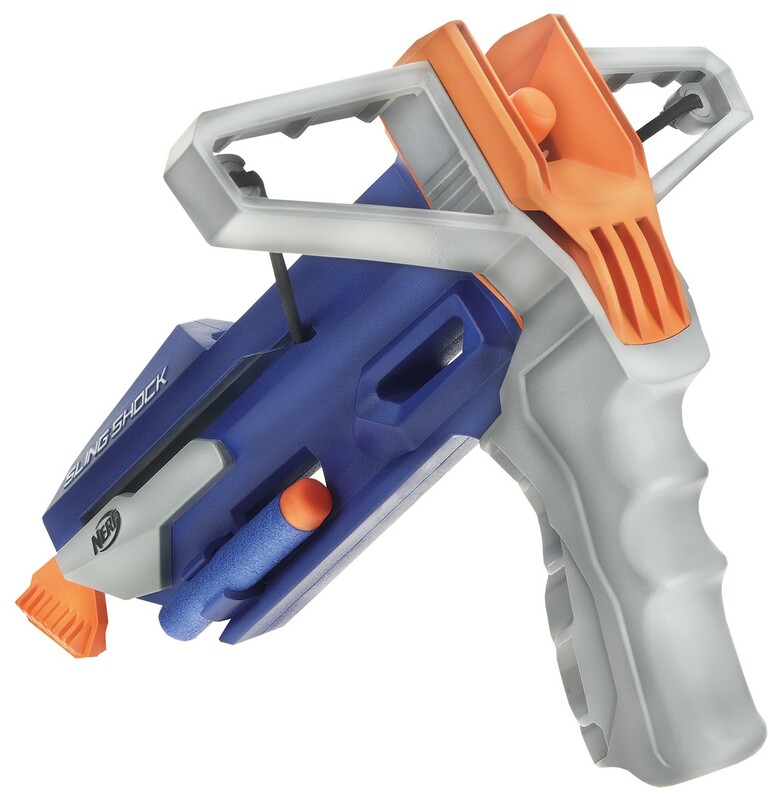 The Mega Series was really missing this: A handy pistol-style blaster.”Handy” of course is relative – in comparison to a Centurion, Thunderbow and Magnus the BigShock is a showcase for sleek design and small scale. But that is not difficult, of course. In relation to normal N-Strike and Elite blasters this is still a Mega monster – both in looks and in performance. The operation is very similar to a Jolt, so it is one of the more minimalist approaches to the rapid acceleration of foam. 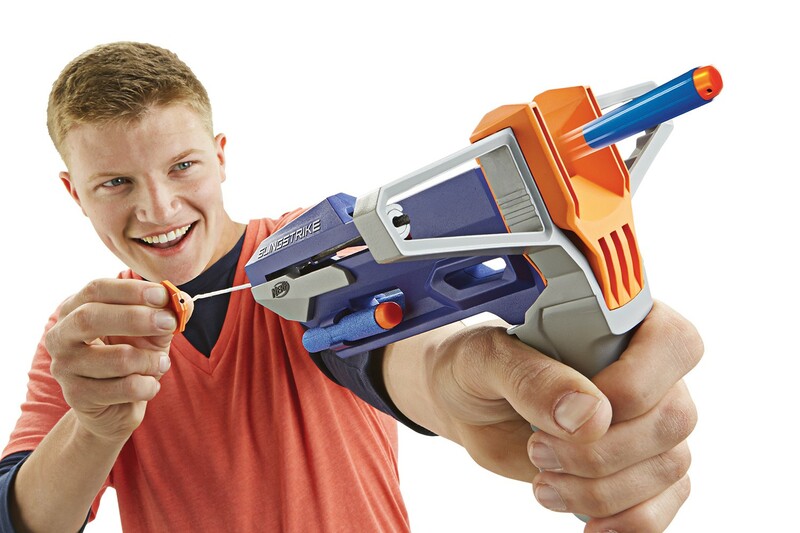 The cocking handle on the bottom of the handle is pulled, one of the giant Mega Darts is pushed inside the barrel – and the blaster is ready to fire. On top of the blaster is a small compartment that can either be used to store an extra dart or as an aimpoint: a small hole makes aiming of players, targets or plastic bottles easy. Well, nobody really demanded it, even less people expected it: but it’s cool nonetheless. The Slingshock looks and works like a slingshot or catapult: with the difference that it shoots the foam darts we know and love. Simply load a dart into the barrel, pull the cord and release – firing a dart over 21m is as easy as that thanks to the increased ranges of the N-Strike Elite XD series. The handling is of course simplified – Aiming with the SlingShock is much easier compared to a real slingshot, especially for kids. On the left and right side of the blaster is a dart holder for spare darts. So if the first shot misses, you have spare ammo for a second and a third chance! Thanks for the clarification and extra translation. It’s much appreciated.